Continuing Noctua’s tradition of supplying customers with its premium-class SecuFirm2™ mountings free of charge, the NM-AM4-L9aL9i kit allows Noctua users to upgrade NH-L9a and NH-L9i coolers to AMD’s AM4 socket (Ryzen). It is a dedicated solution for the NH-L9a and NH-L9i models and has been designed to combine outstanding reliability, optimal contact pressure and easy, straightforward installation. Bringing the trusted SecuFirm2™ quality to AMD’s AM4 platform, the NM-AM4-L9aL9i is an enthusiast-grade mounting kit that meets the highest demands in safety, performance and ease of use. The NM-AM4-L9aL9i kit is compatible with the NH-L9a & NH-L9i only (please choose the NM-AM4-UxS kit for the NH-U14S, NH-U12S and NH-U9 and the NM-AM4 kit for all other models). Owners of the NH-L9a and NH-L9i can obtain the NM-AM4-L9aL9i mounting-kit free of charge via this form. Proofs of purchase (photo, scan or screenshot of the invoice) of both an NH-L9a/NH-L9i cooler and either a socket AM4 motherboard or socket AM4 CPU are required. The NH-L9i has been designed for the Intel LGA115x platform. While it can be installed without any problems on most AM4 motherboards using the NM-AM4-L9aL9i kit, it is possible that it may not fit in some cases. Therefore, please be extra careful when installing the NH-L9i on AM4 and verify that the cooler doesn’t press against any other components. Please also see this FAQ for details. The NM-AM4-L9aL9i SecuFirm2™ mounting-kit is also available for purchase at some of our resellers. If you need the kit urgently, please consider ordering it via a local reseller. Over the years, SecuFirm2™ has become synonymous with impeccable long-term stability and flawless craftsmanship. Enthusiast users and industry clients alike trust the time-tested quality of Noctua's professional mounting systems. In order to cut costs, many manufacturers use cross-platform parts for both Intel and AMD, which can cause compatibility issues. Noctua’s SecuFirm2™ mounting system for AM4 has been tailor-made for this socket in order to ensure optimal compatibility. Having a compact cooler is nice and all, but cooling performance is what really matters. To test this out I employed the might of an 8-core, 16-thread Ryzen 7 1700 CPU. The processor was tested at stock, 3.55GHz, and 3.75GHz. The Furmark CPU burn in utility was used to push all cores to 100% load. Overall I was very impressed by the coolers performance. It handled the 65W Ryzen 7 1700 without much issue at all. I was even able to do a substantial overclock without even coming close to the thermal limit. This is a testament to both the efficiency of Ryzen 7 chips, and the quality of the cooler. As an Amazon Associate, we earn from qualifying purchases. Can the NH-L9i be used on AM4? Which Noctua CPU coolers are compatible with AMD AM4 (Ryzen)? The NH-L9i has been designed for the Intel LGA115x platform. While it can be installed without any problems on most AM4 motherboards using the NM-AM4-L9aL9i kit, it is possible that it may not fit in some cases. Therefore, please be extra careful when installing the NH-L9i on AM4 and verify that the cooler doesn’t press against any other components. 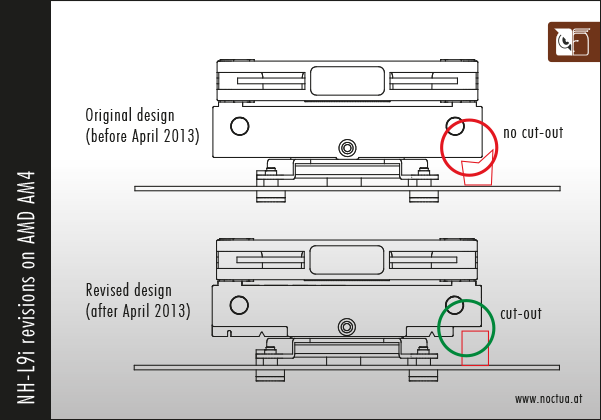 Please also note that there has been a minor revision of the NH-L9i heatsink in April 2013 (see illustration below). Since this revision, the heatsink features a cut-out on one side in order to provide better clearance for tall motherboard components. If you install the cooler on an AM4 motherboard that has tall components close to the socket and if your heatsink has the cut-out, you can orient the cooler in such a way that the cut-out is above the components in order to maximise clearance. Regardless of whether or not your heatsink has the cut-out, please carefully double check that it doesn’t press against any components! Do you have a question concerning one of our products? Please use this form to pose a question! Why are you asking for my country (and, if applicable, state of residence)? We need to know where you’re from so that we can make sure that you will only receive newsletter information regarding products and offers that are available in your region and that our service is compliant with eventual local regulations. Yes, I would like to receive the official Noctua newsletter and agree that my contact data will be saved and used for this purpose in accord with Noctua’s data protection policy. * I hereby acknowledge and accept Noctua’s data protection policy, which confirms that the data I submit via this form will be processed, used and stored solely for the purpose of my inquiry. Please check the captcha form.